The story of the founding of United Artists is one of the more interesting footnotes in Hollywood history. 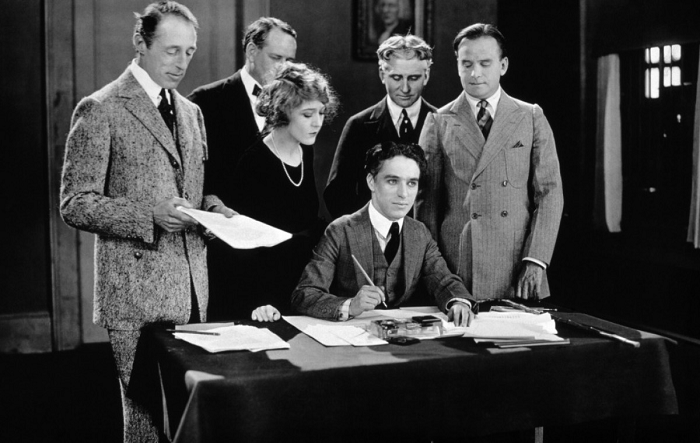 Silent film luminaries Charlie Chaplin, D.W. Griffith, Mary Pickford and Douglas Fairbanks decided to start UA in 1919 in hopes of better controlling their own careers. United Artists was mainly a distributor, but struggled to find output as its founders either saw their popularity decline or struggled to create enough movies to satiate demand. Griffith was the first to leave in the mid-20s. The arrival of sound in the late 1920s ended Mary Pickford and Douglas Fairbanks careers, while Chaplin, the eternal perfectionist, only turned out a movie every few years. Because of that, United Artists mostly relied on production deals with independent producers like Howard Hughes (Hell’s Angels) and Alexander Korda (The Private Life of Henry VIII). The studio also distributed the early cartoons of Walt Disney. UA was successful through these partnerships through the early 30s and distributed a wide selection of movies. The studio remained successful, through high times and low times, through the 1960s where they were bought by TransAmerica and nearly folded in under the corporate label until the stink of Heaven’s Gate in 1980 effectively ended the prestige of the United Artists brand. They were sold to MGM and mostly folded in under the corporate aegis, its logo only occasionally popping up in front of the James Bond movies it helped launch. Hell’s Angels (1930) – Howard Hughes’ mammoth flying epic introduced Jean Harlow to the world. The Front Page (1931) – Best Picture nominee. City Lights (1931) – Silent film, but Charlie Chaplin’s only film from during the pre-Code era. Arrowsmith (1931) – John Ford film and Best Picture nominee. Scarface (1932) – Howard Hawks’ controversial film made Paul Muni a star. Emperor Jones (1933) – Rare film to feature a leading African-American actor. House of Rothschild (1934) – Nominated for Best Picture. Because UA was only a distributor, most of their films either reverted to the companies that produced them such as 20th Century Films (which is now 20th Century Fox) or Samuel Goldwyn pictures. Others are in the public domain.